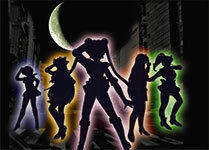 The Warriors of Legend Tour was held in Tokyo, Japan in June 2006. It was a Four Night, 3 Day Tour with all expenses (within Tokyo) included. The tour was sold out, with all ten slots having been filled; tour members came into Japan for the tour from places all around the world- including New York, Toronto, San Francisco, Canberra (Australia), Okinawa, Ohio, and the middle east. Seven of the ten tour members had arrived by the night before the tour was to start, so we met in Tokyo's Ikebukuro for a brief look at the Sakura Taisen cafe, a nice dinner, and checking out some Japanese arcades. 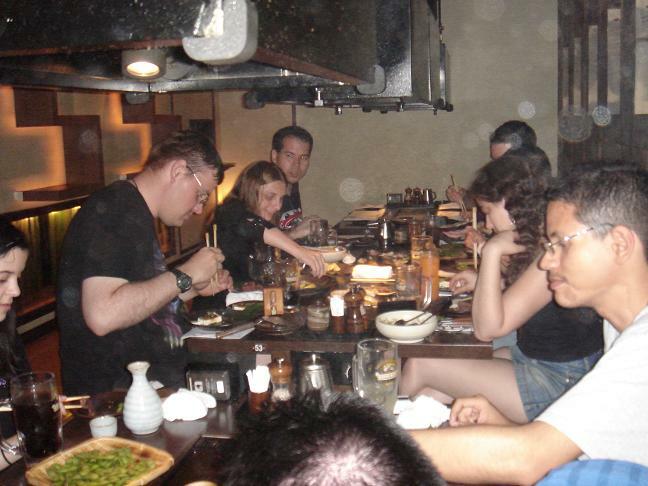 The pre-tour meet up came together at the last minute, when we found that a lot of people were going to be in Japan before the tour began. I met them uptown and we took the train line to Ikebukuro. First we stopped by the Sakura Taisen Cafe to see an interesting anime-themed floor of Ikebukuro's Sega arcade center, then we managed to convince the nearby Italian-chain restaurant to seat 10 people on-the-fly. They broke the tables into two groups but still managed it so kudos to them. Afterward we spent some time at several of the arcades in the area, trying out games from Mario Kart Arcade to fighting against each other in Capcom Vs SNK 2. 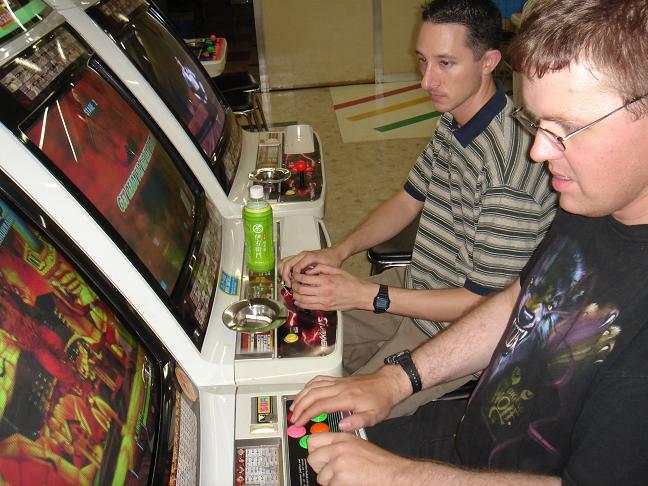 Brant and Jared on the fighting-games floor. Competition was intense. As time rolled onward we had to drag everyone away from the consoles, as tour staff member Hans and myself had a lot of last-minute work to finish to get ready for the tour. 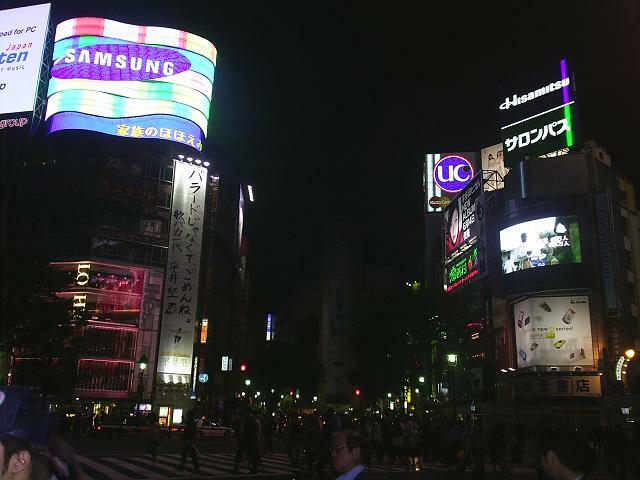 The first day of the tour wasn't to begin until the morning of the 27th, but we had intended to see Tokyo's Shibuya district, the teen-fashion capital of the city, the night before. That day people would be checking into the hotel, while I was to go to the airport to pick up the members who were flying in that afternoon. First, though, about half of the tour members had to make a morning exodus from the temporary hotel they'd been staying at uptown to the Mielparque Hall, the hotel the tour had its reservations at. Hans and I got up after only a few hours sleep to help out and bring our "big box of fun" along with us to the hotel. Unfortunately, the weather was against us, as there was an absolute downpour in the morning. I'm pretty sure that a new ecosystem was developing inside my shoes after they were flooded. The tour was taking place during Tokyo's rainy season, when it rains almost every day and is considerably hot and humid. We were lucky in that it didn't rain for the rest of the tour period, but the heat and the humidity were always a concern. From the airport we rushed to meet the others at the Mielparque, making it there considerably later than expected but none the worse for wear. It was then that Hans and I passed out the "big box of fun"; containing a custom tour hat, polo, and a cell phone for each member. Since we were running late I skipped the long introduction and historical background I'd written up and we rushed to Shibuya. The restaurant, concerned that we'd not gotten there yet, actually called me. 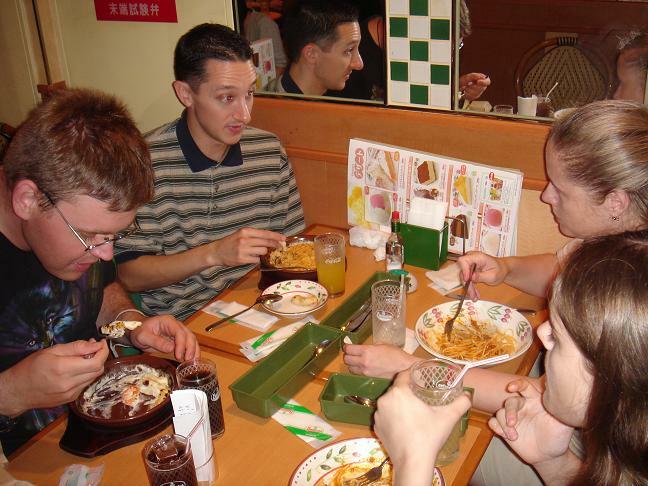 But we got there within ten minutes of the call, and they were hit with fourteen hungry (and some jetlagged) foreigners who walked through the restaurant, to the bemusement of all the seated Japanese, into the party room. 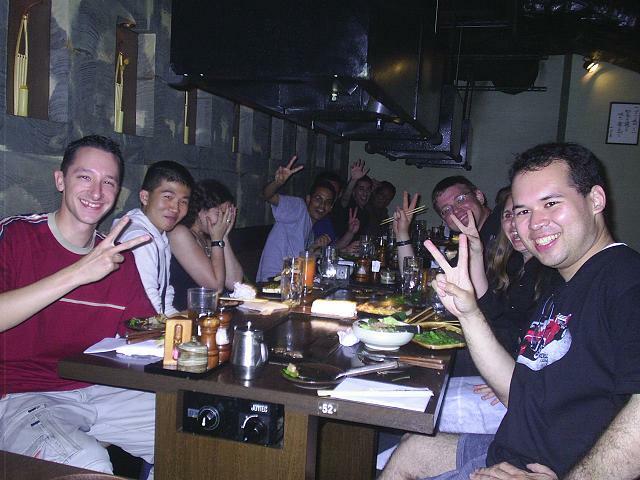 We took off our shoes and sat down for a two hour "teppanyaki" course; the most expensive one they offered. 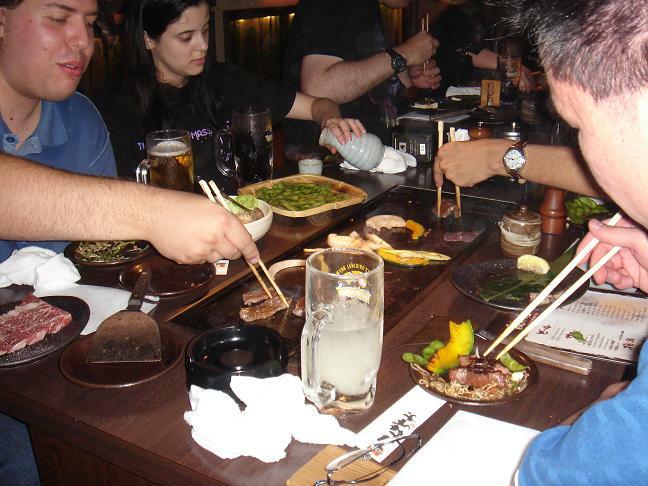 We were loud, sometimes drunk (it was "all you could drink" and sake and beer flowed like water), but everyone really enjoyed themselves. 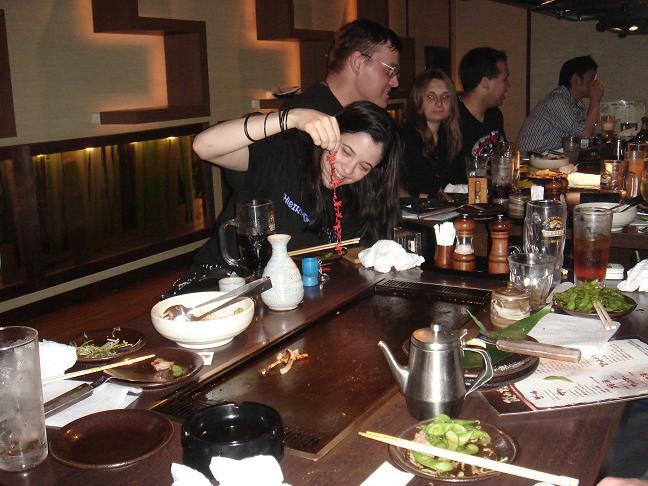 In teppanyaki, you cook the food yourself. In Japan you must "V"! Two Japanese whom the restaurant sat near our group in the private room (I guess the rest of the place were filled) took this picture for us. We kind of felt sorry for the couple, having had to deal with a group of very loud, singing, shrieking (because Yosenex just had to take out his locket) people right next to them. The "quote of the night" is a bit too graphic to print here but involved fish and actions which would probably be illegal if actually capable of being done. 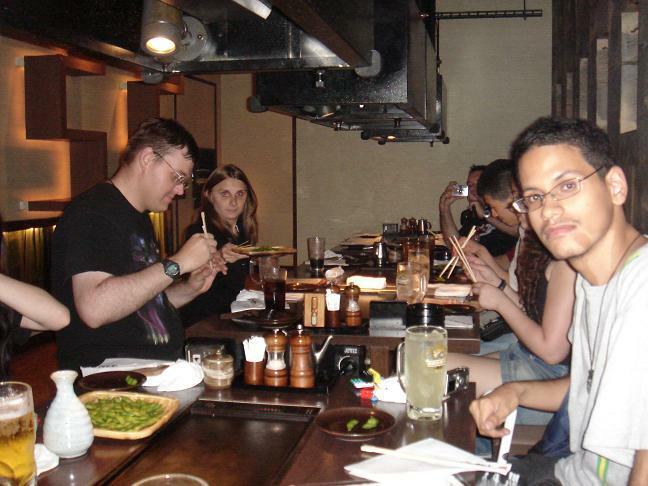 Incidentally, we had fourteen people because we had two guests, Yosenex and a friend of tour member Rochele. After dinner, it was time to sing. 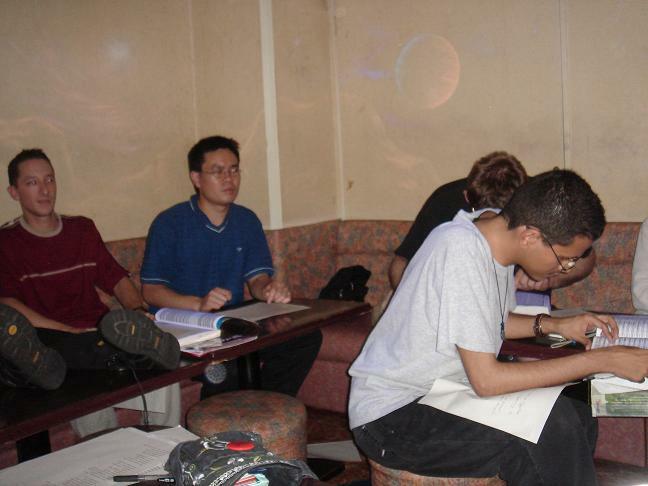 Yes, the fourteen of us went to a nearby karaoke parlor to sing in chorus, starting off with Queen's Bohemian Rhapsody then moving into Moonlight Densetsu, Moon Revenge, and even the Sailor Star Song. After that, it was free time where anyone could sing whatever they wanted; we finished with Kevin singing the Spice Girl's "Stop." lights up. We had a private room with a big-screen TV that would show animation and lyrics. It was a lot of fun to be able to sing songs from the series that everyone knows, to the accompanying animation from the TV show on the big-screen. I don't think any of us will be able to experience something like that again. Although we've got it on video tape, we'll not be releasing that for fear it will potentially incriminate us in the future. After karaoke it was nearing 11pm and we wanted to get up bright and early tomorrow to start touring, so we got ready to leave Shibuya and head back to the hotel. 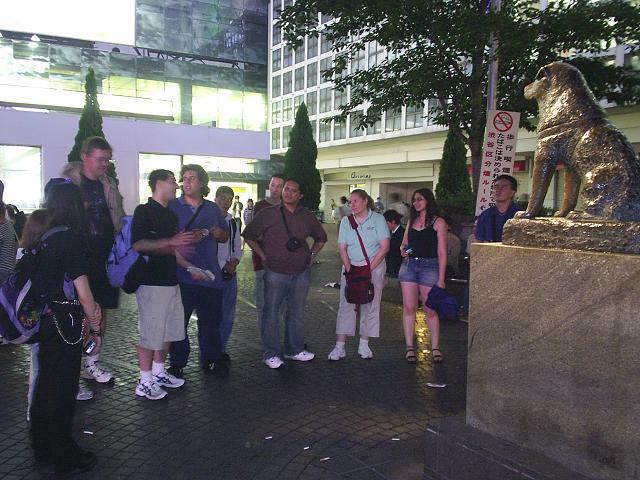 First, we stopped by the famous statue of the dog Hachiko and learned the history behind the statue and why it's become such a famous landmark in the area. We walked back to the hotel, parted ways for the night, and some people (but not Hans and I) got enough sleep to get ready for the next day, the first actual day of the Sailor Moon tour of Tokyo. 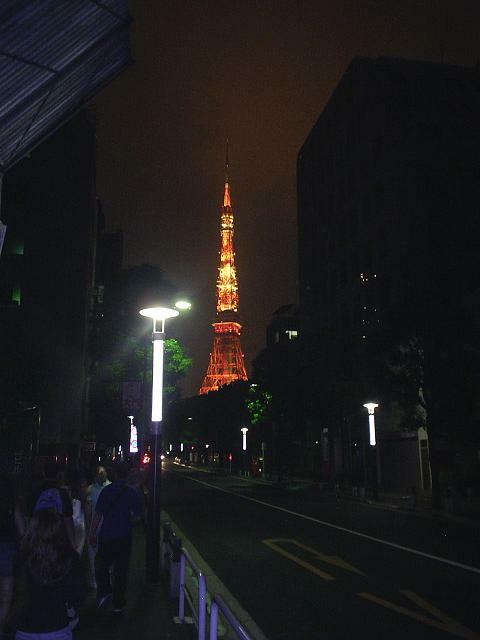 The tour group stayed at a hotel called the Mielparque in Shiba-Koen, near the Tokyo Tower. The hotel is one of the most famous in the area, known for being a place where people go to get married. It's also located in the heart of the Daimon district of Shiba-Koen, near the main strip that stretches between the Tokyo Tower and Tokyo Bay, and next to famous Zojoji temple. 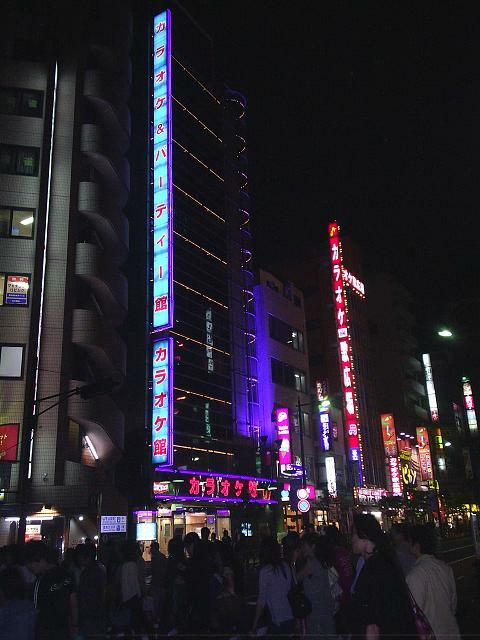 We chose the hotel for a variety of reasons, but primarily because it appeared in the Sailor V manga as a location which the Dark Agency used. It was also convenient to many of the locations we planned to visit (such as Azabu-Juuban), and had reasonable access to both the JR lines and subway lines. Breakfast was included as part of the hotel plan we ordered. In fact, we managed the budget so that all three major meals were covered by the tour costs; breakfast, lunch, and dinner. The hotel treated us pretty well. I had told them that we were a tour group, but I never said what kind of tour group we were. Somehow, though, they found out. Maybe someone forwarded to them the Japanese press we received, which mentioned that we were going to stay at the Mielparque. Here's the story, as told to me by tour member Brant. He'd spoken with the front desk clerk about getting some laundry done, and the clerk told him that they would contact the laundry service, who could take care of it. 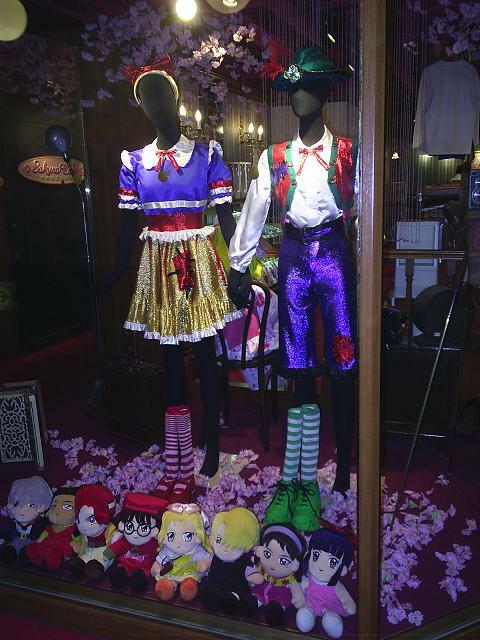 The clerk called the cleaners, and although Brant couldn't make out most of the conversation, he heard the clerk say, "otaku" and "Sailor Moon." Why the laundry person needed to know that he was potentially going to clean clothes for a member of a Sailor Moon tour is beyond me, but I found that incredibly funny. Tour member Jared said that it looked like we were leaving our mark on the city- the legend of the Sailor Moon tour (geek) group- and it looks like that may have well been the case.